Science instruction is increasingly drawing on virtual and interactive technologies to help students visualize core scientific concepts (McElhaney & Linn, 2011; Wu & Huang, 2007), and then to propose, consider, and test competing models to explain the concepts and related phenomena (Schwarz et al., 2009). Physics is certainly no exception. Visualization plays a major role in the advancement of the subject (Kozhevnikov, Motes, & Hegarty, 2007; Lyna, 2008), and model-focused instruction has been increasingly emphasized (Fulmer & Liang, 2013; Liang et al, 2012). While a growing number of simulations have been developed, there is yet insufficient understanding of how teachers can incorporate simulations into classroom instruction, and how this impacts students’ growing understanding of the topic. In this study, we adapt simulations for topics within the Singapore secondary physics syllabi, and then conduct a progressive sequence of mini-studies (tied to the subject topics) with Teacher Learning Communities (TLCs). This will allow us to understand how the teachers make sense of simulations and key issues for further integration into instruction. Building on the work from a completed Senior Specialist Track Research Fund (SSTRF) one-year project (Wee, 2014), this proposed study aims to foster students’ deep learning of physics concepts through collaborative model-based guided inquiry. The students will collaboratively create and use models to predict and explain phenomena and then compare those models with those from canonical science (Schwarz & Gwekwerere, 2007). TLCs will be structured around teachers’ common interests and problems as manifested in joint activities (Muijs, West, & Ainscow, 2010). TLCs will be used as a platform for participating physics teachers to collaborate within and across schools in cross-fertilizing ideas, providing insights, sharing resources, and solving problems throughout the study. The teachers will meet monthly, besides online interactions and discussions. We will used a mixed-method study (with observations, interviews, artefacts, and questionnaires) of students and teachers. We will examine how teachers’ professional learning occurs in the TLCs by analyzing teachers’ interactions within and across schools. A variety of teacher and student data sources to understand the nature of the classroom instruction will also be collected and analyzed. At the teacher level, this will include qualitative data such as discussions, meeting notes, and classroom observations. 1. Provide in-depth understanding of students’ learning of physics concepts through collaborative model-based guided inquiry. 2. Suggest pedagogical strategies that emphasize collaborative model-based guided inquiry and its implications for assessments and curriculum design. 3. Generate data to help uncover the conditions for nurturing robust connections between schools that other emerging TLCs can draw upon. Research has shown that teaching science with a modeling-oriented approach, particularly with interactive simulations, will promote student engagement and understanding. To date, many interactive simulations have been developed and adopted for classroom practices. The purpose of this study was to explore secondary school science teachers’ perceived affordance of interactive simulation as well as their practical experience with simulation implementation in class. Twelve science teachers from seven schools were interviewed individually and the data was triangulated with their teaching plans and student assign- ments. Their past experiences of simulation implementation revealed that most teachers adopted simulations for demonstration purpose in teacher-led instruction. Their attempts to provide students opportunities to use the simulations to explore alternative modeling by themselves did not seem to work well. There are various reasons for this, such as the shortage of facilities, Internet bandwidth, and technological knowledge. There was also a pressing need for teachers to complete the required syllabus in limited classroom time. The majority of teachers’ future intent to use simulation in class was quite weak, especially with the less proficient students who had some difficulty understanding simulations. Although interactive simulations have great potential to promote students’ understanding in abstract science concepts, overcoming the difficulties of implementation may require other alternatives such as a flipped classroom approach. Future studies can investigate how to design learning activities outside class, to engage students in exploring modeling in simulations. The computer simulations that will be used in this study are based on Physlet®, an interactive Java simulation software customizable to the instructional goals by including one or more variables involved in a system or a scientific phenomenon learned. It allows the students to manipulate the variables to see the effects on the system. Such feature helps the students identify relations among components of a system and enables them to visualize and correctly make conceptual connections between representations (Wu & Shah, 2004). In this study, Physlet will be modified based on Singapore physics syllabi. With a modelling-oriented approach in science teaching, interactive simulations promise an engaging learning experience that promotes student involvement and deep learning. The Open Source Physics (OSP) simulations, e.g., Tracker, help students to visualize core scientific concepts and to incorporate model-focused instruction. These skills are also consistent with the MOE’s goals for engaging students in critical and inventive thinking. Existing understandings of how teachers can effectively integrate OSP simulations into classrooms is rather scarce in Singapore. It is difficult for teachers to master the simulation software as an open source freeware. One-off training in OSP is inadequate to support the teachers’ adoption of simulation lessons, where teachers' learning and active participation decline rapidly once it is removed. There is a need for a clear alignment account between the simulation, the classroom and the learning to facilitate recommendations for deployment and sustained adoption. In this study, we aimed to investigate teachers’ adoption, integration, and customization of Open Source Physics (OSP) computer simulation tools, e.g., Tracker, for modelling-focused pedagogy. We provided support for the teachers who were interested in computer-based modelling using simulations by initiating a Teacher Learning Community (TLC). The TLC may illuminate the alignment, training and sustainability problems identified earlier. The research questions were: (a) How do teachers implement the simulation lessons in their classes? (b) What are participating teachers’ attitudes, self-efficacy, and knowledge for teaching with simulations? (c) How, if at all, is participation in the TLC associated with teachers’ ͛implementation, attitudes, self-efficacy, or knowledge? (d) What are the challenges and successes for the TLC in establishing collaborations within and across schools? This study collaborated with two MOE officers with whom we co-designed the professional development workshops for simulation lessons using OSP Tracker, as well as to recruit TLC members. In total, 24 teachers and two MOE workshop facilitators participated in the interviews. The study adopted the qualitative pragmatic approach to study the phenomenon through the perspectives and experiences of the participants. We conducted 30 semi-structured interviews and analysed the data using the six phases of thematic analysis. RQ1 How do teachers implement the simulation lessons in their classes? There were three modes of implementation among the teachers, namely using, exploring and withholding. Teachers who were in the using mode found the simulation-infused model lessons useful, and they could implement these lesson plans in their classrooms after the workshops. For the teachers who were exploring, they deliberated on the compatibility between the affordances of simulations and their school/classroom needs. Teachers who were withholding simulations made informed decisions based on their preferences for real-life context teaching; and perceived constraints in terms of school logistics, student proficiency and class time. While implementation is typically seen in phases or stages, our findings show they are of different modes, and there is no linear order. The three modes of implementation (i.e., using, exploring and withholding) differ at the action levels, where the emphasis is placed in the explanations of what influence the implementation modes. Teachers using the computer-based modelling acted as instructional agents to integrate simulation in their teaching. They replicated the pedagogy they had learnt in PD workshops in their classrooms. Meanwhile, teachers who were in the exploring stage had not taken action to use computer-based modelling in their teaching. They were still searching for a suitable simulation to meet their pedagogical needs. Most likely, if the simulation could not support their teaching, they would not adopt it. Similarly, teachers in the withholding stage did not use computer-based modelling because they viewed it as time-consuming, unsuitable for their students, or they preferred to use a real-time setting for teaching. We found our implementation modes resemble the determinant frameworks that aim to predict outcomes or interpret outcomes retrospectively. Understanding the implementation framework of our study points us to posit providing differentiated support for teachers based on their implementation mode in either using, exploring or withholding. RQ 2 What are participating teachers’ attitudes, self-efficacy, and knowledge for teaching with simulations? Teachers’ attitudes can be characterized into affective, behavioural and cognitive attitudes. Affective attitude refers to personal liking and interest in learning and using the simulation, and the participating teachers expressed positive affective attitudes toward simulation. Behavioural attitude involves the teachers’ overt behaviour directed toward the use of simulation in teaching. For behavioural attitude, the teachers were positive towards simulations, although it was mediated by the logistic issues. Cognitive attitude consists of a teacher’s factual knowledge or perception about the simulation. The cognitive attitudes of teachers towards the simulation were in terms of (a) usefulness, (b) suitability, and (c) usability, with (d) engagement of students as the sole exception. The teachers expressed positive cognitive attitudes when the simulation was deemed useful, suitable for high ability students, ease of use, and improved student engagement. This was mediated when the simulation might create confusion in student learning, deemed less suitable for normal ability students, and difficulty in use. Harnessing from the findings, teacher attitudes were highly intertwined with implementation, where understanding the implementation mode should not be in silos. Hence, changing teacher attitudes may effect changes in the implementation of computer-based modelling. Teachers expressed positive self-efficacy in content knowledge and operational proficiency. Alternatively, they held low self-efficacy in instructional strategy, which included implementation flow and anticipation of students’ responses towards simulation. Teacher knowledge for teaching with simulation is differentiated by technical knowledge and pedagogical knowledge. The teachers demonstrated technical knowledge when they could describe how to use Tracker carefully. They also possessed different ways of teaching simulation lessons as pedagogical knowledge. Furthermore, teachers were capable of integrating technical and pedagogical knowledge for project-based learning. RQ 3 How, if at all, is participation in the TLC associated with teachers’ implementation, attitudes, self-efficacy, or knowledge? 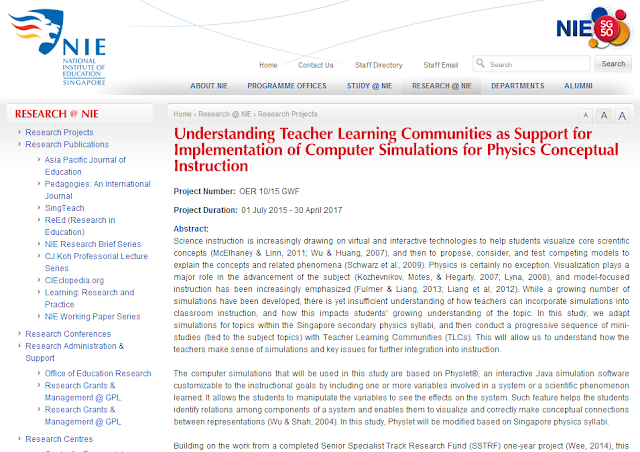 The project envisioned initiating a teacher learning community (TLC) as support for the implementation of computer-based modelling using open source physics for conceptual instruction. To recruit TLC members, we organized eight professional development workshops at the Academy of Singapore Teachers; and incorporated pedagogical training, technical training, and socialization. The TLC recruitment drives through a series of workshops was thwarted by school demands such as heavy workload and timetable conflicts, which resulted in lacklustre TLC membership. Hence, the participation in the premature TLC had minimal association with teachers’ ͛implementation, attitudes, self-efficacy, or knowledge. RQ 4 What are the challenges and successes for the TLC in establishing collaborations within and across schools? The workshops for recruiting TLC members succeeded in professional sharing, that is a form of collaboration within the school. The TLC was still in the infancy stage at the point of concluding the data collection. As a result, the successes of the TLC in building cross school collaborations were elusive. Instead, we found five key challenges in initiating the TLC, namely (a) lack of teacher buy-in, (b) Insufficient communication, (c) no directive from school leader; (d) apprehension in sharing school resources, and (e) no time. The lack of directive was the most dominant challenge, pointing to the need for legitimacy, i.e., formal acknowledgement by school leaders and the MOE. Once the core group is formed through legitimate core participation (LCP), the facilitating processes for nurturing a TLC may follow in the form of reverse legitimate peripheral participation. Theory. At TLC initiation stage, it is important to legitimate members’ participation at the core, i.e., legitimate core participation (LCP). The LCP can complement legitimate peripheral participation (LPP) and reverse legitimate peripheral participation (LPP-1) to enhance existing understandings. NIE Programmes and Practice. Teachers require continuous professional support that is ungratified by one-off courses or workshops. We recommend the building of TLCs that are linked with the NIE fraternity to provide support, as well as to improve research translation. Policy. The provision of "legitimacy" at the core of TLC is critical to foster safe conditions for active participation. Two suggestions to implement LCP are (a) to review the existing TLC initiation approach, and (b) to legitimize the participation of passionate volunteers to become part of TLC core. This projects investigated an initiation of a TLC as support for the implementation of computer-based modelling using open source physics simulations. The building of TLC requires a much longer runway, and we posit the need for legitimate core participation as a critical enabler in its infancy stage. The professional development workshops were useful for teachers who were using or exploring simulation, but less effectual for those who were withholding simulation lessons. The teachers’ attitudes were also highly associated with their implementation. This study was funded by the Education Research Funding Programme, National Institute of Education (NIE), Nanyang Technological University, Singapore, project no. OER 10/15 GWF. The views expressed in this paper are the authors’ and do not necessarily represent the views of NIE.